It’s tough being an indie app developer these days. 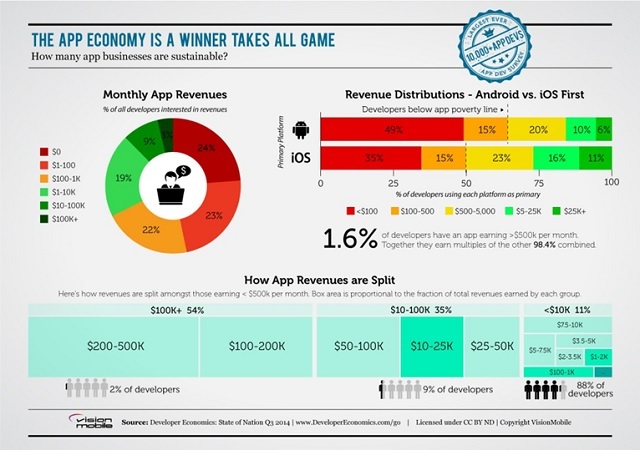 The average income for indie devs has dropped dramatically within the past year due to the intense competition and oversaturation within the App Stores. According to The State of the Developer Nation Q1 2015 report 52 percent of indie app developers globally make less than $500 per month. This obviously is not enough for anyone to survive. More and more indie devs are being forced to make the transition from being a full time self-employed app developer to being just a mere hobbyist who develops apps on the side. If an indie does have to go through this heartbreaking transition it usually results in them taking on jobs for “The Man” in fields which are completely unrelated to App Development or even the mobile app industry all together. This played out on a global scale could lead to a massive shift in the direction of this industry and ultimately lead to corporate and Mega Studios dominance, not to mention a slowing of innovation. If you’re one of the many who is experiencing this unfortunate scenario you should know of some alternative ways in which you can monetize your skill set without having to completely leave this still young and blossoming industry. Following the famous saying of “If you can’t beat ‘em , join ‘em!” may hold true in this particular situation. If you can’t make enough money developing and monetizing your own apps then maybe you can help other indie app developers build their apps. The rest of this post will be focused on sustaining your existence as an indie app developer through the selling of your specialized app development or marketing services. Determine what your area of expertise is within the app development and marketing spectrum. Try to be as specific as possible. Truly evaluate your strengths and weaknesses and find out what you enjoy doing and what you can specialize in. See what others within both the freelancer and agency arenas have to offer. What kinds of services are offered by freelancers on freelance sites? What kinds of services are offered by agencies online? What are they charging for these services? Can you compete? Is it worth it to compete with them? Create a list of Freelance websites where you can post your services. There are many freelance websites available online where you can openly post your services, some better than others. Below is a list of some of the top app developer freelance websites. The competition on most of these freelance websites is fierce. Once you post your services you will need to find ways to market your services and to bring traffic to your listing. This can be done by doing basic offsite Search Engine Optimization/Social Media Optimization. Once you set up your profile on all the top Freelance websites you need to continue networking on forums, blogs and other communities where indie app developers may be active. This is an ongoing job! The fight to stay alive as an indie app developer won’t be easy. Continually innovating and diversifying the monetization of one’s skill set will be vital to surviving in this industry. Thanks for that informative post! I think the key to getting work as a freelancer app developer or marketer is to continue to network within forums and communities such as AppTaskit.